NEW SOUTH WALES, AUSTRALIA. Less than six years into production with a cleanskin workforce, Glencore’s Ulan West underground coal mine is thriving. A new development system has eliminated constraints to help the operation stay ahead. 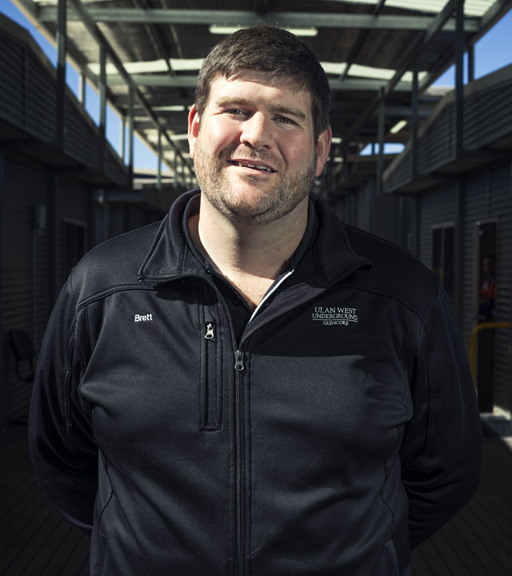 Brett Murray, engineering manager at Glencore’s Ulan West coal mine. Coal in the most valuable portion of the seam – the middle 2.6 metres known as the D Working Section – has an average ash content of less than 15 percent. It accounts for most of the 6.7 million tonnes of export-grade thermal coal Ulan West produces annually. The longwall mine is a four-hour drive northwest of Sydney and 50 kilometres north of Mudgee, a country town of 10,000 on the western slopes of the Great Dividing Range. The region’s hills host some of Australia’s highest vineyards, producing Cabernet and other red wine varietals. Most Ulan West employees call Mudgee home today, but the majority of them had never so much as set foot on a mine site before the operation started producing development coal in 2012. Skills were in short supply when construction of the billion-dollar mine began in 2011, so Glencore recruited a workforce from a wide range of other sectors to start careers in mining. Seven of the 12 longwall panels at Ulan West are each longer than seven kilometres, which has increased development demands. “We can longwall retreat for over 12 months at a time before we do longwall moves,” Murray says. To help keep pace, the mine invested in two Sandvik MB650 bolter miners, rapid roadway development units for simultaneous cutting and bolting. “We needed fast advancing development equipment that can hold many metres of mesh, consumables and corresponding bolts to minimize restocking,” Murray says. “That allows us to maximize the bolter miner’s advantages.” Ulan West operated the first MB machine in front of a shuttle car. Glencore is one of the world’s largest and most diversified producers of natural resources, and one of Australia’s largest coal producers with 13 mining complexes – including 17 operational open cut and underground mines – across New South Wales and Queensland. The company managed the production of around 93 million tonnes of saleable thermal and coking coal last year, more than half of which was produced in New South Wales. “The MB650 is strong at getting good, long development runs, well suited for our long development panels,” Murray says. “Even in front of a shuttle car, the MB650 proved advantageous over the previous machine we had.” Ultimately the mine opted to implement a flexible conveyor train (FCT) continuous haulage system to reduce haulage bottlenecks. Sandvik worked with Ulan West to ensure a seamless integration between the bolter miner and the FCT and optimize the capability of the total development system. 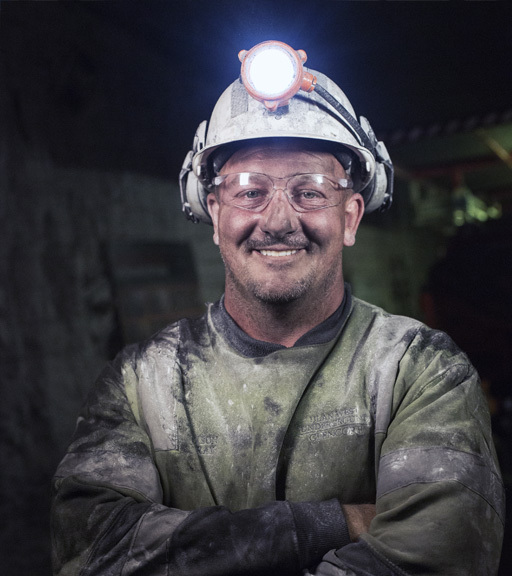 Bolter miner operator Jason Bray is one of only a handful of industry veterans at Ulan West. The bolter miner features the Sandvik automatic cutting system – nicknamed AutoCut – designed to enable a consistently accurate profile and improved roadway quality. The AutoCut system guides the cutter boom to cut the required section within a pre-given profile contour. The bolter miner’s PLC calculates necessary boom cutting traces based on operator input parameters. “It’s so simple,” Bray says. “We just find the height that we want on the roof and just press ‘start Auto’ and it cuts 3.2 metres every time. As long as we set the machine to the same angle as the seam, you can’t dig a hole, you can’t go wrong. It couldn’t get any easier to drive.” The AutoCut system and semi-auto bolting enable Ulan West operators to shift their focus from simple, repetitive tasks to solving problems and developing ideas for process improvements. “The MB650 improves our efficiency and consistency while also allowing us to remove our operators from dustier, noisier environments,” Murray says. After a year of operation Ulan West is impressed with the cutting performance, bolting capabilities and reliability of Sandvik MB650. The Ulan West underground coal mine is part of the 18,000-hectare Ulan Mine Complex, situated in the Western Coalfields of New South Wales 260 kilometres northwest of Sydney and 50 kilometres north of Mudgee. The complex includes the Ulan No. 3 and Ulan West underground mines and an open cut mine. Construction of the billion-dollar Ulan West began in May 2011 and the first longwall coal was produced in May 2014. The mine is expected to produce 6.7 million tonnes of export-grade thermal coal annually through 2033. Sandvik MB650 bolter miner is designed for rapid entry roadway development and is able to simultaneously cut and bolt, improving advance rates. Sandvik MB650 is effectively a wide-head continuous miner incorporating unique design features for cutting, loading, ground support and face ventilation. A low cutter head rotation speed reduces dust generation while an automated, programmable cutting cycle helps ensure smooth floor conditions. Bolting rigs are an integrated part of Sandvik MB650. The layout allows space for four roof bolters and two rib bolters, all of which are placed immediately behind the cutter drum. The bolter miner’s loading and conveying unit moves independently from the cutter drum, improving loading efficiency.